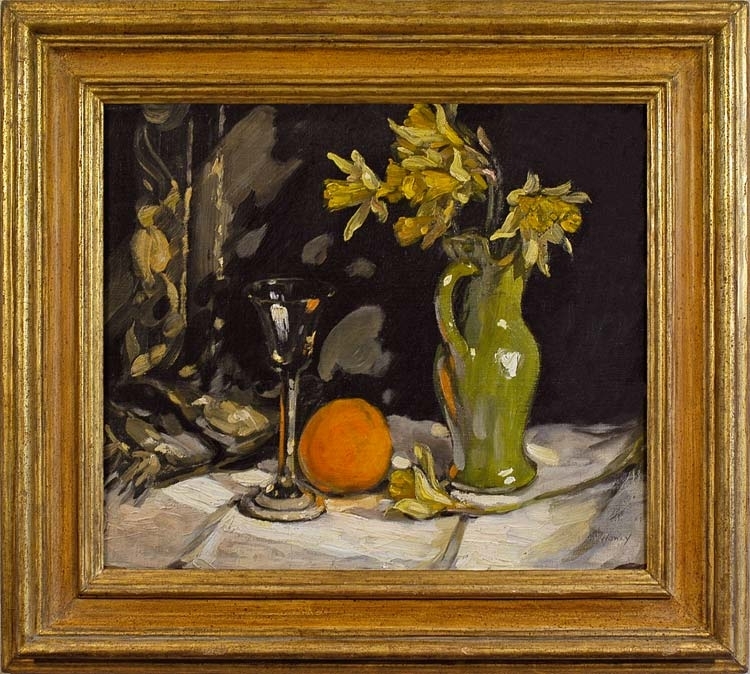 Howey’s work is recognizable by its painterly qualities and thickly applied impasto, evident in this still life, where the succulent strokes of pure colour are laid on a dark ground and achieve a rich, sullen glow. He tended to paint mainly landscapes, producing brilliantly lit and coloured visions of the rivers and woods around Staithes, and of the coast at Hartlepool, some of which are almost Fauve in effect. This work is rapidly and confidently painted, the daffodils in particular demonstrating his control of his medium. John William Howey (1873-1938) was born in West Hartlepool, and attended the local School of Art, where he was taught by the landscape artist, Edwin Denyer. He became one of the Staithes Group of artists, who worked en plein air around the village of Staithes (pronounced ‘Steers’) in Yorkshire during the late 19th- early 20th century. A number of the group had studied at the Académie Julian in Paris, and the influences which mutually fertilized them came from the Barbizon School, the Impressionists, and the Newlyn School in Cornwall. The group of around forty also included Rowland Hill, Laura Knight and Harold Knight. Howey never worked as a professional artist; he became a collector with the local gas and water company, but was accepted as an equal by his peers, inviting some of them (Rowland Hill, for example) to paint in his studio. He used both watercolour and oils, but was most adept at oil painting, working with a thick brush or palette knife; he produced landscapes, still life and portraits. He exhibited at the Royal Institute of Oil Painters, the Royal Academy (1924 & 1925 by report), the Sunderland Art Gallery and the Laing Gallery, Newcastle; his son, Robert Leslie Howey, became a professional artist.